One of the few items I have neither been able to give up nor compromise on is my Arrowhead Mills Organic Creamy Valencia Peanut Butter. It is smooth, creamy, and sweet, and has the most voluptuous texture I have ever experienced in a peanut butter. One of my earliest childhood memories is eating a spoonful of peanut butter. I'm not sure exactly how old I was, but based on the house in which we were living at the time I was definitely five or under. I remember the intensity of the flavor, but what I remember more is how it made my tongue stick to the roof of my mouth with a strength that rivaled glue (ok, that's probably a huge hyperbole but you get the idea). I smacked and I slithered and I tried to slide my tongue from side to side, but that peanut butter wasn't going anywhere. It was a long time before I would let anyone fool me enough to put that in my mouth again. Over the years, however, it seemed that peanut butter lost that intense flavor and stickiness. I assumed it was because I had grown up, and my tastes had changed. Until I had my first taste of natural peanut butter. BAM! I was right back in that moment of having a mouthful of that intense peanut flavor and a stickiness that I had to work really hard to get off the roof of my mouth. In that moment peanut butter was promoted forever from that place in my cupboard where it would sit forever until that day when I had absolutely nothing else to eat in the house and would live on PB&J sandwiches (or PB&honey, or whatever I had around) until I got paid or could get to the store again. I started with Laura Scudder's natural peanut butter, and then just bought whatever brand was less expensive, because it was all more expensive than the commercial brands. When I started eating more consciously in 2000, I took an even closer look at the foods I was buying than I had before. Natural peanut butter was no longer enough. I started looking at organic brands. They were much more expensive even than the regular natural peanut butters, but I decided it might be worth it, depending on how much of a difference I could tell. 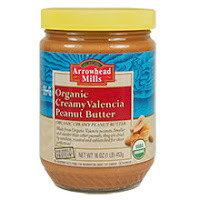 And Arrowhead Mills Organic Creamy Valencia Peanut Butter stood head and shoulders above all of the other brands. It had to; even back then it was over $5.00 a jar. But it was creamy and smooth and rich, and sweet with the natural sugars of the Valencia peanuts themselves. It was the only peanut butter I would eat. If they were out of it at the store, I wouldn't buy any other brand. I would wait. Since I have been on a budget, I had a hard decision to make regarding this peanut butter. It is so much more expensive than the other peanut butters, but so much better. I couldn't give it up, so I just decided to use it sparingly. And it has been hard, but I could no longer be lazy and whip up a sandwich for breakfast if I didn't feel like cooking anything else. I doled it out like it was eggs in England during the Blitz. I think I bought 2 jars over the past 6 months. Remarkable restraint, if I do say so myself. Last week I went to buy jar number 3. I cruised down the peanut butter and jelly aisle, looking for that familiar yellow lid. To my surprise, the lids were no longer yellow, nor were they plastic. They were blue metal. Oh well, not the worst thing in the world. I put the jar in the basket and went merrily on my way. "Huh?," I said to myself, "Where's the Valencia? "Blend? What does that mean? That doesn't sound good. "Look at the ingredient list. What's it say? Yes, I really did have that conversation with myself, right there at the grocery store. I only hope it was in my head and not out loud, but anything is possible. That sucked. I wheeled my cart back to the peanut butter aisle and put the jar back on the shelf. It is worth every extra penny for Valencia peanut butter. For anything else, it's highway robbery. And the price had definitely not gone down. Instead, I grabbed a jar of Koeze's Cream-Nut All Natural Peanut Butter, which is not bad even if it is not Valencia Peanut Butter. I decided not to panic. When I got home, I went to Arrowhead Mills' website and clicked on the Contact Us button, where I sent a message basically to the effect of "Hey - WTF?" Although I did not use those words. I was polite and just asked what was up. Thank you for taking the time to contact us regarding our Creamy Peanut Butter. We strive to maintain the highest quality products and appreciate your patronage. Going forward, our Nut Butters will state that it is a Valencia Blend due to the availability of Valencia Peanuts themselves. If insufficient amounts of Valencia Peanuts are unavailable, we will go with a blend of Valencia and other peanuts. No sure what that meant. Sometimes it will be all Valencia peanuts, and sometimes a blend, and I have to just buy a jar to see which it will be? At the same price? Again, I say WTF???? Thank you for your reply to my previous email, but I find your response to be vague. Have you replaced your Valencia peanut butter with a blend of Valencia and other peanuts? I don't want to presume here, but if there's always the chance that it will be a "blend" and no way for me to know, why should I continue to buy this product? We no longer have just the Valencia Peanut Butters. They will all now be Valencia Peanut Blend. Ok, so there it is in black and white. Since they did not give me a reason to continue to buy this product, I will no longer be buying this product. When I asked what was behind their decision (I will spare you another quote), the response was that there is a shortage of organic Valencia peanuts. Always wanting to give the benefit of the doubt, I did some online searching to see if I could find any references to a shortage of organic Valencia peanuts, but all I found was one vague reference to a future shortage of organic peanuts (from 2005). And, of course, the great peanut shortage of 1913. I am not the only one bemoaning the loss of this awesome product. Lacosta at Resistance Is Fertile is even more devastated than I am. She called them, and they apparently told her it was "a change the company decided on." It looks like Heinz owns 20% of Hain Celestial, which owns Arrowhead Mills. Hain Celestial also went into a partnership with Cargill Health & Food Technologies in 2003. So who made the decision, and why? Guess I'll never know. R.I.P. Organic Valencia Peanut Butter. I will miss you. But I will never buy Arrowhead Mills nut butter of any kind, ever again. Unless, of course, they bring back the organic Valencia peanut butters. PUHLEEZE!!!!!! ACK - now I'm begging. When I was a kid there was a Swiss Colony (in the back of Famous Liquors) that we used to go to. They had one of those peanut butter making machines, and you used to be able to take samples. I was equally obsessed with the process of the machine and the incredible adhesive properties of the butter itself. Only the orange juice squeezer at Dominick's was cool. They need to start putting those machines back in stores. Now is the time. The Treasure Island near me used to have one, misreall, but I haven't seen it for a while. They still sell the hand-ground peanut butter there, though, so I imagine it's around somewhere. Whole Foods has them too, but I miss the bulk butters they used to carry. I think I'm going to have to start grinding my own (surprise, surprise). I googled "Valencia Peanut Butter" to try to find out why Arrowhood Mills is no longer making a 100% Valencia product. I loved the Arrowhood Mills PB too, until they added no-flavor peanuts. I just wrote to them and let them know I won't buy their product unless they bring back the 100% Valencia version. If enough of us do, maybe it will work. Here's hoping...!